The product offered by Qatar Airways varies depending on which type of plane you are on. The most common plane they operate on long haul routes from the U.S. to Qatar is the 777. Almost all of Qatar’s routes from the U.S. to Doha are on 777s other than a few from the northeast. Qatar’s 777s feature a 2-2-2 configuration with fully lie-flat seats. Unfortunately, the seats are not staggered or in a herringbone configuration, meaning if you are in a window seat you will have to climb over your seatmate to get out. We recommend trying to a get a center seat if you value privacy. The seats themselves are spacious and comfortable. They have a unique feature with a tray table that slides out to unveil a drink holder compartment below, stocked with a bottle of water. If you are lucky enough to fly on a Qatar A350, you will be in for a bigger treat. Qatar doesn’t have many routes from the U.S. on these planes, but there are some from JFK and Boston. These are very new aircraft, containing the most modern version of just about every feature. On Qatar’s A350s, business class seats are arranged in a 1-2-1 reverse herringbone configuration. Every seat features direct aisle access. The seats aren’t quite as private as those in some other airlines that use this configuration such as Cathay Pacific, because the headrest encasing does not wrap around to cover the side of your face. You will notice the modernity of the plane when looking at some of the smaller features. The entertainment system controller is much more modern than you will see on most planes. It looks like a smartphone and has a sharp touchscreen interface. This is a welcome upgrade from the cumbersome controllers with sticky buttons you find on most entertainment systems. The seatbelt sign also has an electronic display and text in addition to the standard diagrams. You can switch on the tail camera on your entertainment screen, and the views are really amazing. The picture is much clearer than the blurry ones you will find on other planes. Qatar planes all come with a decent in-flight entertainment screen, though it is not anything special. The headphones are supposed to be noise cancelling, but in reality are not that great and you may want to bring your own. 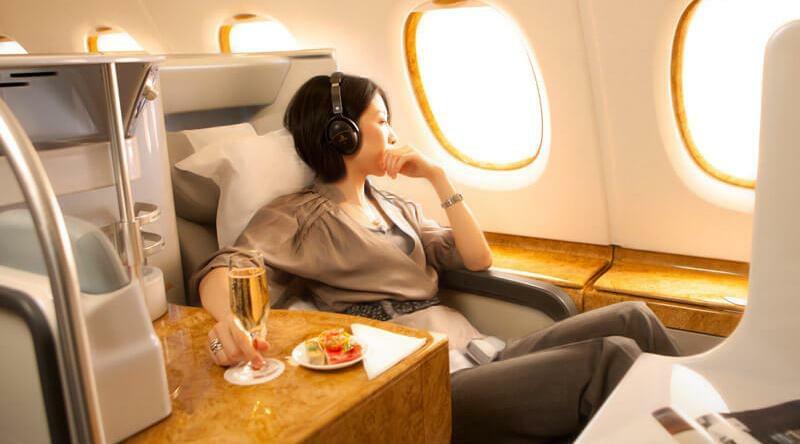 Emirates has a much less consistent offering of hard products. Most flights from the U.S. are on 777s that only have angled-flat seats in a 2-3-2 configuration. There are also some flights on A380s which offer a better product. The seats on the 777 fleet are actually a bit embarrassing given how Emirates’ marketing tries to position itself as a luxury airline. The non-staggered 2-3-2 configuration on the 777s mean that over 40% (3/7) seats don’t have direct aisle access (the window seats and center seats). The legacy fleet also has angled-flat seats that don’t recline 180 degrees, making sleep difficult for many passengers on long haul flights. The one bit of good news here is that beginning in November of 2016, Emirates will start offering a new seat that is fully lie-flat, however the 2-3-2 configuration will remain. And of course, it will take quite a bit of time for the entire fleet to be retrofitted with the new seats. Certain routes from the US feature the iconic A380 (JFK, IAH, LAX, SFO) which is a much nicer product than the current 777. The premium cabins are all located on the upper deck in a 1-2-1 configuration. These seats are fully lie-flat and all feature direct aisle access. The in-flight entertainment on Emirates is really amazing. There are over 1500 channels with a wide variety of movies and music in many languages. And of course there is the famous on board bar where you can partake in snacks, drinks, and socialization at any point during the flight. The amenity kit contains Giorgio Armani products, which is quite high end for business class. The staff on Qatar are very quick to offer nuts and wide selection of wines, champagnes, and other beverages. The dining on Qatar is regarded as excellent. They take care in food preparation and the food actually has enjoyable flavor unlike most bland airline food. The portions can be a bit small however. One quirk with Qatar is there are not schedule meal services, rather everything is on demand. Qatar is generally regarded as having excellent cabin staff. They ranked 6th in the 2015 Skytrax World Airline Awards in this metric. Anytime you ask for something expect to be served promptly and with a smile. 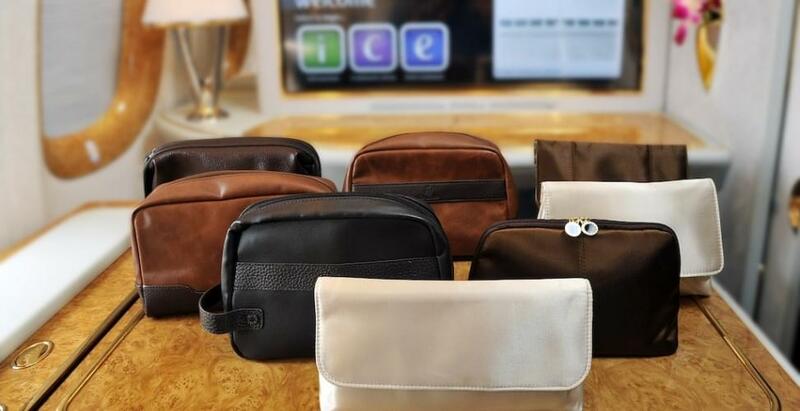 Emirates provides an excellent amenity kit from Bvlgari. They also have different kits for men and women so each passenger can get a more customized set of toiletries. As with Qatar, Emirates allows you to request your meal any time during the flight instead of having it served at a pre-determined time. Their menu is quite extensive and offers multiple options for the three main courses plus appetizers and desserts. Emirates also has generally excellent cabin service, though not quite as consistent as Qatar. They ranked 10th in this metric in the 2015 Skytrax World Airline Awards.